On the 2nd of June 2017 I purchased a single stick of Corsair CMV8GX4M1A2133C15 8 GB DDR4 2133 MHz for my brand new i5 6500 & gtx 1060 build. I used this build for gaming and today I was getting lots of blue screens with the message error: memory management. I ended up reinstalling windows but as I go through with the installation it randomly tells me that I have to make sure that all the files are on the USB for the installation. I have tried redownloading a new iso file. I have watched many videos on this error and some of them are hinting to a memory issue. If someone could confirm that this is 100% a memory issue that would be great, Also my games kept crashing frequently over the past couple of days and google chrome would come up with an 'Aw snap' message every so often. 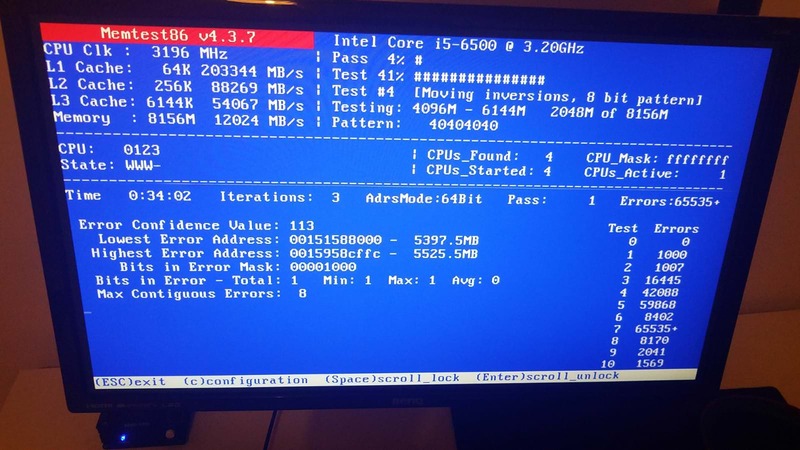 Why don't you try memtest86? Install on a bootable usb (or run a copy bundled with a bootable linux usb like ubuntu). It really looks like a memory problem but it would certainly help to confirm that directly with memtest86. I think it is time for new ram. Thanks for the solution! Question My Window services is using 4G of 16G installed. What would happen to my system if I only had 4G installed memory. Question Is it possible to use my old ssd with windows 10 installed on my new motherboard? Installed 24GB RAM on Asus P6t, all 24GB show up in ubuntu but only 16GB show up in Windows 7. I installed 16GB (2x8GB) Ram, but Windows only shows 8GB though can read 16? Windows is saying only half my ram is installed?